Sichuan Cuisine, one of the major cuisine styles in China, originated from the states of Ba and Shu in ancient China. In the Western Han (206 BC-24 AD) and the Western Jin (265-316) and Eastern Jin (317-420) dynasties, Sichuan Cuisine took shape. 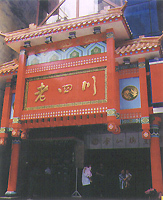 In the Ming and Qing dynasties, because of the introduction of peppers, Sichuan Cuisine formed its own unique taste and shape, and began to influence the surrounding areas. The main- characteristics of Sichuan Cuisine: (1) Prepared with a wide variety of ingredients. (2) Presenting various shapes and tastes, and famous for spicy food, fish-flavored shredded pork and food with odd taste. (3) Boasting numerous cooking techniques, such as stir frying, frying, stir-frying before stewing, and braising. Famous dishes: Stir-fried Diced Chicken with Chilli and Peanuts, Stir-fried Bean Curd in Hot Sauce, Fish-flavored Shredded Pork, Rice Crusts and Sliced Pork, Stir-fried Sliced Beef, etc. 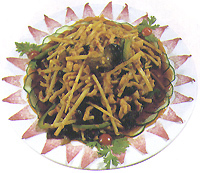 Snacks: Sichuan is famous for various kinds of snacks. Prepared in different ways, they feature different tastes, low prices and good quality. Famous snacks include Couple Lung Slice, Lai Tangyuan (stuffed balls made of glutinous rice flour served in soup), Zhong Dumplings, Dandan Noodles, Dengying Beef, etc. Legend has it that this dish was created by Su Dongpo, a famous poet of the Song Dynasty (420-479), who was a native of Meishan County, Sichuan Province, hence the name. 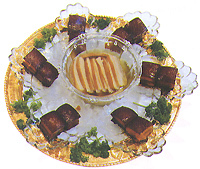 This dish was created in the first year of the Tongzhi reign (1862) of the Qing Dynasty by Chen Xingsheng Restaurant. The main chef was the wife of Chen Chunfu, who had a pockmarked face, hence the name. 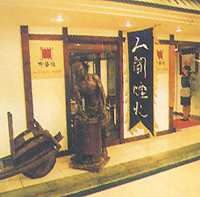 Later the restaurant was renamed as the Pockmarked Chen Grandma's Bean Curd Restaurant, which became famous far and wide. At the end of the Qing Dynasty, Pockmarked Grandma's Bean Curd was listed as a well-known dish in Chengdu. In the past Sichuan Hot Pot was very spicy. Now people can taste hot pot with spicy, clear or milky soup. 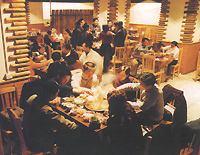 A hot pot may be divided into several parts, and a customer may instant boil food of three or four tastes in a same pot, in addition to various herbal medicinal hot pots. This kind of hot pot is suitable for the Chinese people from the south or the north, and for both Chinese and foreign customers. Chongqing is the birthplace of Sichuan Cuisine. As compared with Chengdu's Sichuan Cuisine, Chonqing's has a stronger taste, spicier and more innovative. Chongqing serves the best Sichuan Cuisine. Its cuisine ranks first in the major cuisine styles of China because of its distinctive characteristics. Romantic and Leisure "Binjiang Road on the Southern Bank"
Binjiang Road on the southern bank, totaling 8,000 m long, is a new tourist attraction, with a large number of famous restaurants, bars, cafes and Western restaurants in Chongqing. Here tourists can have a nice view of the mountain city and taste various kinds of delicacies. Chongqing Hot Pot, which is famous for its "spicy, hot, delicious and crunchy" taste as well as a harmonious and warm atmosphere, originated from a centrally administered municipality by the Yangtze River in the early 20th century. Preparations for Chongqing Hot Pot are meticulous, involving a wide variety of ingredients. Now hot pots are in vogue all over the Chongqing.